Superior Rapid Response strives to maintain our exceptional status as the professional carpet cleaning company of choice in Sarasota, Florida. We give every customer a written estimate that fully describes the work to be done, including our price. We NEVER overcharge our customers. Unfortunately, not every carpet, tile & grout or upholstery cleaning company in Sarasota has the same ethical business practices as Superior Rapid Response. Every year around this time the “snowbirds” return to Sarasota and we hear stories of unethical carpet cleaning companies taking advantage of unsuspecting customers. We were contacted by an elderly lady to clean the carpets in her condominium. The property manager of the association had recommended us. We prepared an estimate for cleaning the carpets in the bedrooms and presented it to her, she immediately told the Techs they must have made a mistake with the estimate. As it turns out, last year when she had her carpets cleaned, she moved all the furniture out of her bedrooms and placed it back once the carpets had been cleaned.... the company charged her $600.00! The Techs asked her if the other company applied fabric protector or did anything else for the $600.00? She said no and stated they did not even clean the carpets very well .... Amazing! Once we finished cleaning, we invited her to inspect her carpets. She was extremely satisfied! When we attempted to put the furniture back in the bedrooms she stopped us and said she would put the furniture back in the bedrooms herself. UNBELIEVABLE! The Techs decided to discount the estimate they had given her, after all, she was going to put the furniture back in the bedrooms! These unethical carpet cleaning companies give the carpet cleaning industry a bad reputation. Please don't let this happen to you. 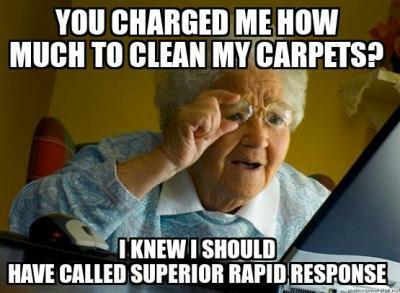 To request your free carpet cleaning estimate from Superior Rapid Response, call 941-923-3610 or visit us at www.superior-rapid-response.com.